Antibiotics save lives when prescribed carefully to fight infection, but their overuse has led to a well-known phenomenon of resistance that can render those medications useless. The American Academy of Pediatrics, as part of the Choosing Wisely campaign, wants to protect hospitalized children from the effects of antibiotic resistance by providing a list of recommendations to serve as a starting point of conversation for physicians and patients. Experts acknowledge that certain illnesses warrant antibiotic use, but these medications should be used only for patients at high risk of having a bacterial infection and, when indicated, for the shortest duration possible based on scientific evidence. Ultimately, the decision is made at the discretion of the medical team. Pediatric infectious diseases and fetus and newborn experts from the AAP and the Pediatric Infectious Diseases Society collaborated to develop the list of practices. Before antibiotics are prescribed, testing of the patient’s blood, urine and other appropriate cultures should be undertaken to confirm suspected invasive bacterial infection. During surgery, the dose and timing of antibiotics to prevent infection are important for optimal effect, and should not be used indiscriminately. Ampicillin is the first choice of treatment for children hospitalized with community-acquired pneumonia who are otherwise healthy and immunized. Broader-spectrum antibiotics, such as cephalosporins, have been shown to contribute to antibiotic resistance and are often unnecessary. Antibiotics such as vancomycin or carbapenems should be avoided unless a child is known to have a specific risk for pathogens that are resistant to other antibiotics. Avoid using prolonged courses of IV antibiotics. For most infections, children respond well to orally administered antibiotics after a brief course of intravenous therapy. Peripherally inserted central catheters, used to facilitate prolonged courses of IV antibiotics, often result in complications. 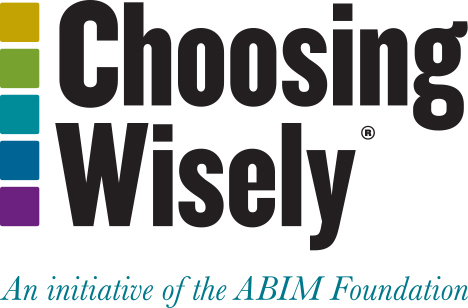 Choosing Wisely is an initiative of the ABIM Foundation, which seeks to promote conversations between clinicians and patients in choosing care that is supported by evidence; does not duplicate other tests or procedures already received; is free from harm; and truly necessary. At least 80 medical specialty societies have published more than 500 recommendations of overused tests and treatments as a result of the initiative, launched in 2012. For more information or an interview with an author, contact Lisa Black at lblack@aap.org (630-626-6084) with American Academy of Pediatrics (AAP) Public Affairs.